As usual combats with fighters could be seen going on all around by the lights of tracers from each aircraft. 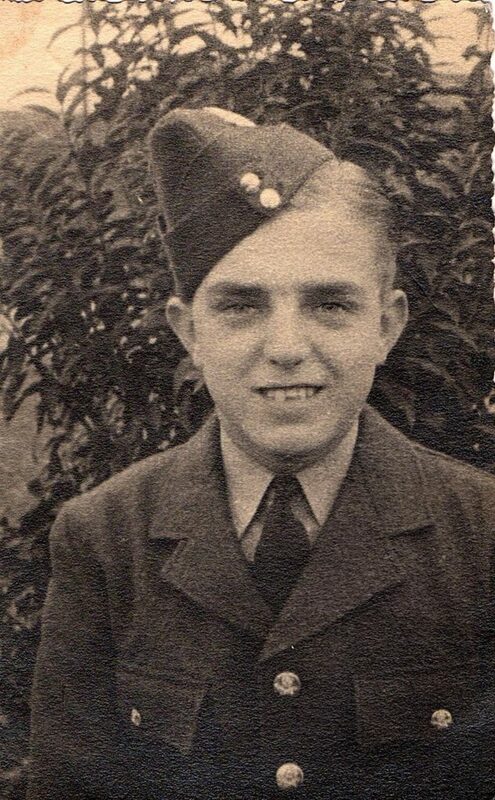 Sergeant John Sargeant DFM from Frithville near Boston, attended Boston Grammar School – aged 19 in 1943 when he served with No 106 Squadron based at RAF Syerston, Notts. The story from which these words are taken was found by John Sargeant’s widow after his death in 1970, written in pencil in an old notebook he had kept in his desk. He called his story “Just another night out”. ‘We arrived over Berlin one hour after avoiding a few searchlights and near misses from flak bursts that seemed pretty close on the starboard side. When we turned on, I saw quite plainly two or three aircraft, each coned by about twenty or thirty searchlights on our starboard side, having hell knocked out of them by flak. It was the same on the port side where half a dozen searchlights were doing their best to pick us up in their beams. As usual combats with fighters could be seen going on all around by the lights of tracers from each aircraft. Now it was our turn for the run up to the target. As we got to our positions the skipper’s voice came over the intercom: “Everything okay? Turning on”. Then the bomb aimer’s voice, “Bomb doors open, Skip”. We were still doing violent evasive action when the fighter attacked again, this time from below, raking the aircraft from stem to stern. I was on the floor, having been thrown there from my standing position beside the Skipper by the sudden evasive manoeuvre and having seen the fighter attacking the first time from the rear starboard quarter with his tracer rounds entering the rear of the fuselage. I stayed on the floor, unable to do anything to help, waiting for ‘my packet’ if it was coming, while watching my panel of engine and fuel gauges for any trouble that may suddenly break forth. Fortunately, at that moment they were okay. As I lay there during the second attack, an explosive shell burst immediately below my position and shrapnel whirled through the floor and out through the roof. A few pieces of shrapnel ripped into the back of my left knee. The lower part of my leg went numb and I thought I had lost it, but I managed to stand up on my right leg. My other leg was intact but I was unable to put my weight on it. The pilot, Squadron Leader David Howroyd, successfully ditched the aircraft when fuel was almost exhausted. After rapidly exiting the floating aircraft on to the starboard wing, despite his own injuries, John Sargeant and two others went back inside the aircraft for the injured rear gunner. Unfortunately, the rear gunner, Sergeant Les McKenzie died in their dinghy before the crew was rescued by an Air Sea Rescue launch. Whilst John Sargeant was recovering from his leg wounds in hospital the remaining survivors of his crew continued on operations and were reported missing on the night of 8/9 October 1943 on an operation to Hannover – they were all killed.